The articles in this section provide fast and easy methods to solve Aptitude Questions on LCM, HCF, Number System, Trains, Time and Speed, Boats and Streams, Mixtures and Alligations, Pipes and Cisterns, Cyclicity of numbers, Time and Work, Time and Distance, Average, Percentage and Ages. In each topic we had provided tips and tricks, math shortcuts and formulas with detailed explanation to solve Aptitude problems. Hope these articles will help you crack CAT, CPT, CSAT, XAT, MAT, GMAT, Bank PO Exams. To test your aptitude skills, fully solved mock online aptitude test is provided with each category for self assessment before appearing for Competitive exams and Campus Interview. Every placement test on quantitative aptitude will contain at least 30% questions on number systems and number series. Aptitude questions on number system form the backbone for placement preparation. You can score easily on quantitative aptitude section if you understand the basics of number system. Since the questions on number systems are simple, importance lies in acquiring the right skills to tackle these problems with speed. Every aptitude exam that you take will contain at least one question from mixtures and alligation. CAT, XAT, MAT, GMAT, Bank PO tests, campus placement tests do give a lot of focus on mixtures and alligations. Questions from this section are nothing but word problems on ratio and proportion or percentages or weighted averages. In this article we will have a look at top aptitude questions on Mixtures and Alligations, basic concepts, important formulas and how to solve Mixtures and Alligations problems easily and quickly. Quantitative aptitude questions on pipes and cisterns are similar to time and work problems. They are commonly asked questions for bank tests, career recruitment tests, management entrance tests and other competitive exams. Questions on pipes and cisterns can be mixed with questions on mixtures and alligations to increase the difficulty level of questions. Quantitative aptitude questions on pipes and cisterns when mixed with ratios can be a bit tricky. But a strong understanding of the concept behind solving them and practicing as much questions as possible can help you easily solve them. In this paper we will have a look at frequently asked top aptitude questions on pipes and cisterns, basic concepts, important formulas and tricks and shortcuts on how to solve pipes and cisterns problems easily and quickly. Quantitative aptitude problems on time and distance are sure questions in any competitive exam like GRE, GMAT, CAT, XAT, MAT, Bank exams or any other campus recruitment tests for that matter. These problems are often lengthy and test takers often skip them, thinking these questions will consume most amount of time. This is a mistake. 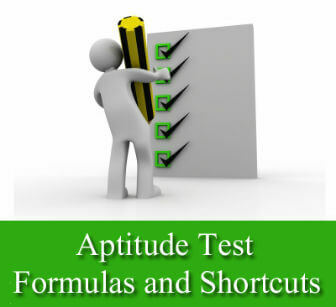 All quantitative aptitude examinations will have questions based on percentage system. Most of the questions from this category are related to change of percentages or successive change of percentages, for example "In a shop price of Laptop which is marked at $1000 was discounted 20% for Christmas eve and further 30% discounted for New Year eve. What is the price of Laptop now?" Here we have provided a set of basic concepts, tips and shortcuts on how to solve percentage problems easily and quickly. Quantitative aptitude questions on trains are a special case of time and distance problems. The only difference is that the length of the train and length of the object that the train crosses has to be considered to solve them. This is because the distance has to be covered by the entire length of train. Numbers is one of the main sources of questions in all of the B-School entrance exams. Especially CAT exam consist a lots of questions related to numerical properties. In the old format of CAT, a lion's share of the questions asked from the area of numbers and geometry. Basic number properties and its advanced application is one of the main testing points in CAT, MAT, XAT etc.